** During baby’s firs six months in this world, playing is all about awakening of his senses. 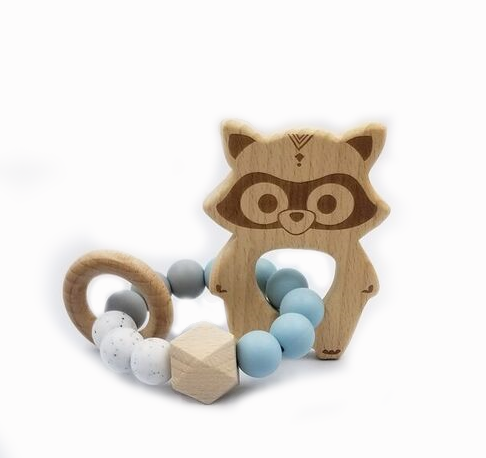 P & M rattles will help your baby develop his motor abilities while encouraging interactions with his environment, Your baby will love looking at them, hearing the sound they make when they fall to the ground and biting at them during his teething phase. **Contains no harmful products (BPA, phtalates, cadmium and lead free). The wood used is untreated (*no oil or wax applied). Consistent with health Canada’s recommendations. It is recommended to clean your accessories with mild soap and water. If the product is only made of silicone, it can be cleaned in the dishwasher. For accessories containing wood, it is recommended to apply our natural wax or simply apply coconut oil.